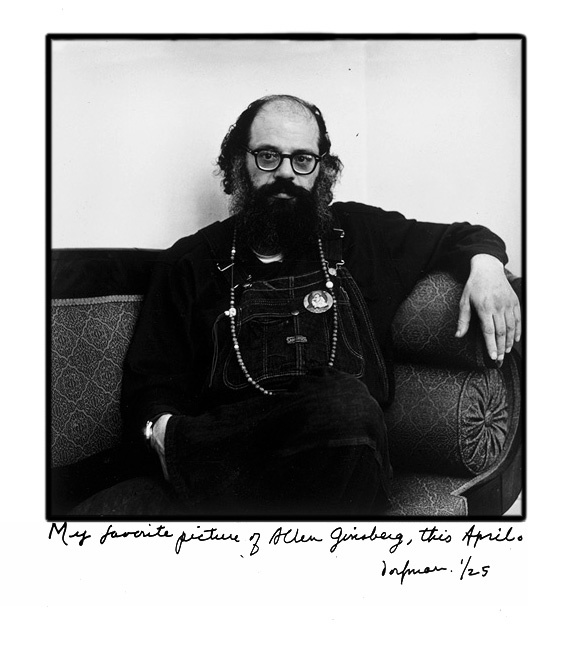 Allen Ginsberg is a person dear to me in reality and important as an idea. About once a week, I'm in a situation that makes me ask myself, 'What would Allen have done?' The most recent time this happened, I was having supper with Francis Russell at his house, when a neighbor, who is a Pentecostal Episcopalian and be-liever in healing, dropped by. Her name was Harriet and she had just come from a three-hour trip to a hospital visiting and praying with a thirty-five-year-old woman dying of cancer. She herself was about forty-two and ninety pounds overweight. She was very upset by her brief afternoon with the dying woman and kept on assuring herself that God had heard them. Probably, her distress was increased because she knew Francis was annoyed by her conviction. 'That woman will never get better; she's going to die,' he insisted. But that didn't deter her. She told us that she goes to her church meetings four times a week -- in a town half an hour from where she lives. Then, to make light of her religious activities, she added with a laugh that she was a forty-year-old Jesus freak. She went on, confiding to me that she had been healed of bad gums, and that now she was going to ask for help losing weight. I thought that was a good idea, not so different from going to Weight Watchers. She described how she got into Pentecostal religion -- about the bad trips she had had before she believed. 'I was asleep for a whole year.' I liked her. In my head I heard Allen. He wouldn't be afraid he'd catch Harriet's depression. Or be embarrassed by the rawness of her unhappiness. He wouldn't let her dismiss herself. Somehow, he'd lead her out of that notion toward some self-respect. Perhaps by saying he was a sort of Jesus freak himself -- he'd just spent three months meditating ten hours a day and was building a temple with his own hands. Could she top that? Too, Allen is so interested in people's spirituality that he would have asked Harriet a million questions; but he'd come at it in such a way that she wouldn't end up explaining herself. He would offer a prayer for her dying friend. Tell Harriet about the healers he's met all over the world. How he'd actually found one Five blocks from Flagg Street. And if Francis happened to ask Allen, as he asked me, do you believe in all that stuff, Allen would reply with a softness. She's a good woman, outgoing, needing the world. When it was time for me to go back to Cambridge, I shook Harriet's hand. I knew for sure Allen would have embraced her, blessed her with an Indian chant. But I was too shy to hug her, though I thought of it. I felt it wouldn't work for me, there at least, in Francis's living room; but being polite and saying, 'See you in the Square,' was more distant than I felt. 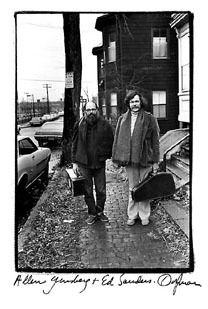 November 1972, Allen came with Ed Sanders to Cambridge to raise money for a loose confederation of folk singers. The phone rang on the Saturday night of their performance. 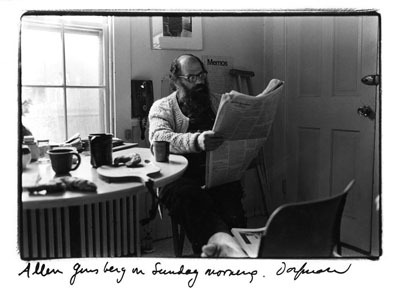 I had come in from hawking my photographs in Holyoke Center and was sitting at the kitchen table counting my money. 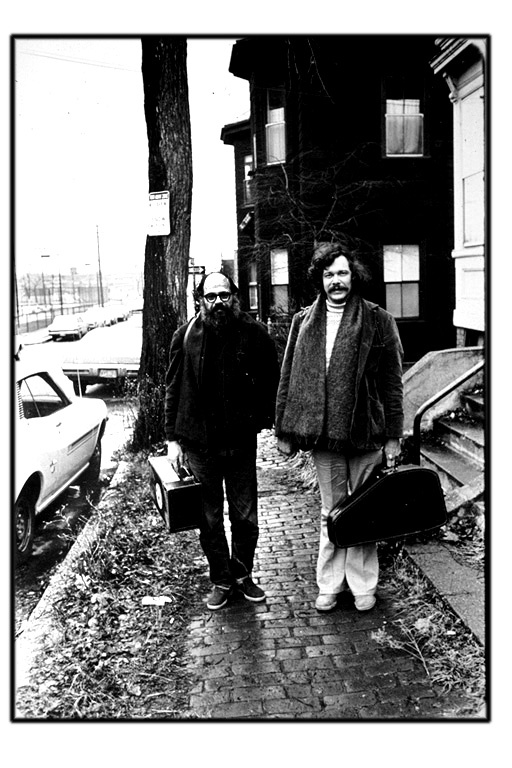 I left everything and met them at Sanders Theater, where they were playing with Danny Kalb. After the show, we went to a party around the corner. Ed found someone who gave him leads/names of obscure cult groups in Arkansas. 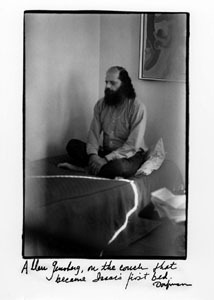 Ever since he wrote The Family, about Charles Manson, he's been obsessed with the sect phenomenon and has become an authority on it. He had been in a funky mood, but now he was delighted, took out a notebook he was carrying even then and wrote everything down meticulously. I was impressed with how thoroughly he cross-examined his informant; he sounded just like Harvey. I took the picture of him and Allen outside the house, very early the next morning just before I drove them to the airport. 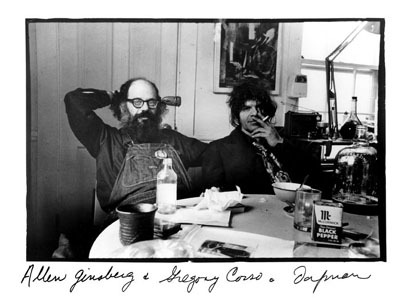 The pictures of Allen eating at the breakfast table, of Allen and Gregory Corso in the kitchen, of Allen and Peter Orlovsky in the living room, were all taken in April 1973. They were here for a Kerouac festival at Salem State College. Characteristically, their arrival was a surprise. Ilene, Ed Lang, and I had spent the whole day making Ilene's movie. Harvey and I were in a distance period. I was tired and cranky. No, I didn't want to go out for supper with Ilene and Ed. I was going to bed. As if sensing that I needed to be distracted from any self-pity, the steam pipes in my cellar burst. All of a sudden I heard this rushing water. Unmistakable. I had to find the plumber on a Saturday night, turn off the oil furnace, do something about the mess. I sat in the kitchen figuring out what to do next. There was a hard knock at the door. The plumber so soon'! No. Peter Orlovsky. God couldn't have been more provident. I think the miracle of old friends is that they do come, as if by sonar when you need perking up; surely if you keep things going, cast enough nets as Paul Blackhurn would say, things will happen. So there we were, the three of us huddled in my freezing kitchen waiting for the plumber. Allen was in a cast up to his hip from slipping on the ice in Cherry Valley. Peter was waging his campaign against smoking and wearing his Vietnam T-shirt. Bustling like a white tornado. Full of high cheer. Scouring my sink. Oh Ellie, naughty, naughty, a dirty sink. Well, at least no ciggies. What are all these papers'! Do you read all these magazines? 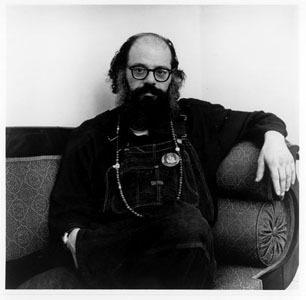 So Allen and Peter stay over, and Sunday morning, Ilene comes to finish the film, shooting the rest of the footage of me taking pictures of Allen and Peter singing Blake songs and new compositions on the couch. Bobbie Creeley calls on Monday that she'd like to come into town, she's east visiting Bob in Buffalo where he is teaching for the semester. Sure. We were all together. 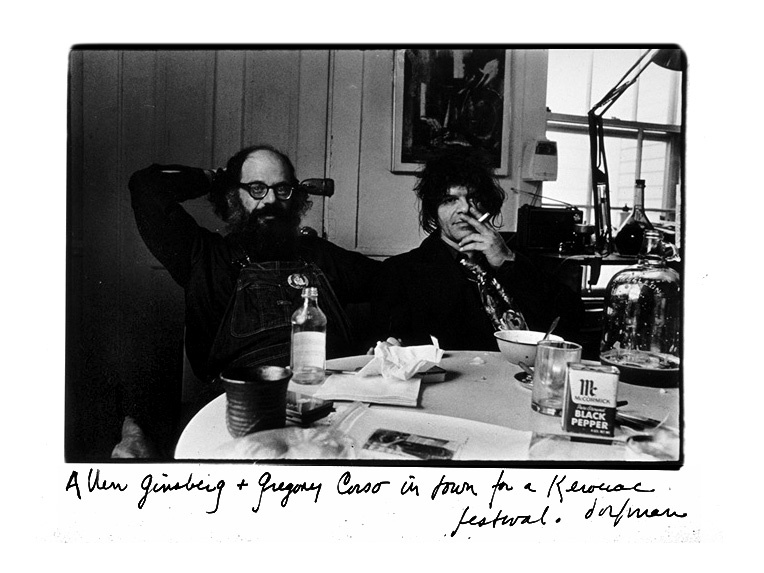 Gregory Corso came over often during the week, reciting poetry in the living room to John Limon, being irascible and responding only to Allen and John, whom he called Giovanni.